This superman comes without the muscle chest. 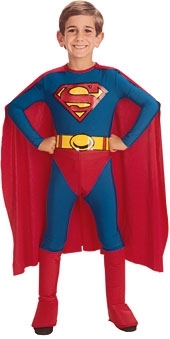 Still perfect for flying through the skies and solving the problems of the world, it consits of a jumpsuit with attached boot tops, belt and cape. Available in small, medium and large child sizes.